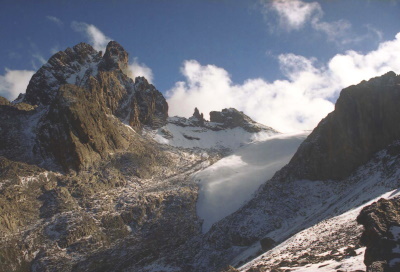 Mount Kenya National Park / Natural Forest protects the region surrounding Mount Kenya, the second highest mountain in Africa at 5,199 m.
The mountain is an extinct vulcano. It has 12 remnant glaciers on its slopes, which are retreating rapidly. Also there are several small lakes and it is the main water catchment area for two large rivers in Kenya; the Tana and the Ewaso Ng'iso North. At lower altitudes Colobus and other monkeys and Cape Buffalo are prevalent. Some larger mammals such as elephants range up to 4,500 m.
There is a drought now all over Kenya, as the mini rainy season of Nov 2005 did not come. So the Masai bring their cattle and sheep up to the tourist area. This drove away the animals. The cows meanwhile are dying from the altitude and new germs which they have no resistence to. Seeing a lot of dead and dying cows being butchered was not fun. Wildfires: 2019: "fires have already destroyed more than 80,000 hectares of forest and grassland, which represents almost half the area of the World Heritage site"
Charles Darwin: The Darwin Glacier was named by the geologist John Walter Gregory - the first person to reach the icefields of Mt Kenya in 1892/3.In his book "The Great Rift Valley" he describes that this "was so named as we owe to Darwin the first precise description of a glacial valley in England"
Sacred Mountains: It has been regarded as a sacred mountain by neighbouring Kikuyu and Meru people. Fatal Accidents or 'disasters': "On July 19, 2003, a South African registered aircraft, carrying 12 passengers and two crew, crashed into Mount Kenya at Point Lenana: nobody survived"
Country named after them: The mountain was named by Krapf as both Kenia and Kegnia when he first sited it in 1849 apparently using a native word which he recorded (possibly Kikuyu Kirinyaga?). The colony in which it stands was originally known just as "British East Africa Protectorate" but the growing number of white settlers led to a change of status in 1920 when the "Kenya Colony" was created - named after the mountain. Because of their indiginous origins the names of both the mountian and the country were carried forward unaltered into the post colonial era. Foreigner prices: Different prices for Citizens, Residents and Non-Residents. From 430 Kenyan shilling to 52 USD.